This 16 days Everest base camp trek itinerary includes the Kathmandu full day city tour and enough acclimatization break along the trek. 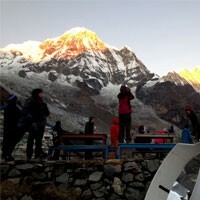 We make a customized Everest base camp trek as your interest. We also make 12 days Everest base camp trek itinerary, 14 days Everest base camp trek itinerary, 10 days Everest base camp trek itinerary, 2 weeks Everest base camp trek itinerary, 11 days Everest base camp trek itinerary on your demand. After landing at Tribhuvan International Airport our representatives will drive you directly to the hotel where refreshments await. Once properly introduced with the guides and office representatives you will be free to do as you wish. Journeying around the Thamel area will be a pleasant experience the adventure seeker in you. Overnight stay at a hotel in Kathmandu. Day 02 : Pre-trip meeting and Kathmandu city tour. The day kicks off with a pre-trip meeting where we discuss the trip plans. The Kathmandu city tour begins with a pleasant experience climbing up the steps of Swayambhunath before heading to the Hindu site of Pashupatinath. The journey winds down towards the historical courtyards of Kathmandu Durbar Square before ending at Boudhanath beneath the mesmerizing sunset. Overnight stay at a hotel in Kathmandu. Day 03 : Fly to Lukla (2840m.) and trek to Phakding (2610m.) 3 hours. The journey begins with a scenic flight to one of the most scenic and thrilling airstrips at Lukla. The early morning flight gives way to perfect views of the entire region while the morning sun illuminates the landscapes. After landing at Lukla airstrip we begin our trek to Phakding. The journey out of Lukla passes through pleasant forest landscapes before reaching Phakding. Overnight stay at Phakding. The journey heading out of Phakding begins in the familiar stretches of the forested trail guided by the occasional glimpses of Thamserku (6,608m) leading towards Jorsalle. The hamlet of Jorsalle denotes our entry to Sagarmatha National Park adorned with exquisite floras and faunas. Beyond the confluence of Bhotekoshi and Dudh Koshi rivers, the journey turns through the Himalayan rugged trail heading towards Namche Bazaar. Overnight stay at Namche Bazaar. Today, we take the first of our two acclimatization days to let our bodies adapt to the increasing altitudes. Guided by the stunning views of Mt. Everest (8,848m) we begin our day with a mesmerizing trek to the Everest view hotel. Trekking through stunning Himalayan panorama we continue our journey through the surrounding reasons with visits to Everest View Hotel which is the hotel located at the highest altitude in the world. Overnight stay at Namche Bazaar. Day 06 : Trek from Namche Bazaar to Tengboche (3860m.) 5 hours. Having entered the Sagarmatha National Park earlier, we begin our journey towards the hamlet of Tengboche. The journey begins with a pleasant trail alongside the mesmerizing forested trail surrounded by the exquisite Himalayas. The hamlet of Tengboche is well known for Dawa Choling Gompa home to the Mani Rimdu festival observed for peace and prosperity. Overnight stay at Tengboche. The changing altitude is reflected by the changing landscapes as lush green forest give ways to alpine shrubs. The majestic peak of Ama Dablam (6,856m) guides the alpine trail heading past thinning pine and rhododendron trees to reach the snowy trail leading to the Himalayas. The final climb leads to Dingboche through the familiar rugged Himalayan trail. Overnight stay at Dingboche. At Dingboche, we take our second day off for acclimatization purposes. Surrounded by mesmerizing Himalayan landscapes Dingboche is a great place to take a day off. The surrounding peaks of Dingboche are a perfect place to begin our acclimatization journey with stunning Himalayan landscapes of the entire Everest Himalayan Region. Overnight stay at Dingboche. Today we head towards the Sherpa hamlet of Lobuche surrounded by the mesmerizing Himalayan peaks. The trail winds down squeezing through the majestic peaks of Cholatse (6,440m) and Taboche (6,367m) continuing towards the foot of Khumbu Glacier. The hamlet of Lobuche is the final stop before heading towards Everest Base Camp. Overnight stay at Lobuche. Day 10 : Trek from Lobuche to Everest Base Camp (5364m.) via Gorakshep (5140m.) 7-8 hours. Today, we head towards Everest Base Camp crossing Gorakshep on our way. The trail winds through the familiar ridges of Khumbu Glacier before dipping down to Gorakshep. Past the majestic Khumbu Glacier, we reach the famous Everest Base Camp, the entry point to the world's tallest mountain. Although the peak of Everest shrouded by the clouds and cannot be observed from the base camp, the rush of adrenaline and the achievement of stepping on the foot of the world's tallest mountain are incomparable. After the exploration of Everest Base Camp, we return to Gorakshep. Overnight stay at Gorakshep. Day 11 : to Kalapatthar (5545m.) 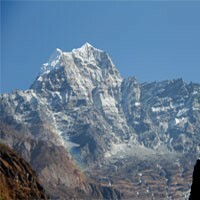 descend to Gorakshep and trek to Pheriche (4210m.) 5 hours. Today, we journey to Kalapatthar viewpoint to witness the mesmerizing views of the Himalayas glistening in the early morning sun. The majestic peaks of Everest (8,848m), Nuptse (7,861m), Changtse (7,543m), Lhotse (8,414m), Ama Dablam (6,856m), Lingtren (6,749m), Cho Oyu (8,188m) illuminating with the rising sun is a sight to behold. Having our fill of the glistening Himalayas and stunning panorama, we begin our descent towards the lake bed at Gorakshep, from where we begin our trek back to Pheriche. Overnight stay at Pheriche. Day 12 : Trek from Pheriche to Namche Bazaar 6-7 hours. The decreasing altitudes welcome the lush green forests as we begin our descent. Leaving behind the stunning views of Thamserku (6,608m), the journey heads through rough sandy trail heading up and down through the Hilly landscapes. Surrounded by Mani stones and prayer flags, we continue our journey reaching Tengboche beyond which lie the stairs leading up to Namche. Overnight stay at Namche Bazaar. Day 13 : Trek from Namche Bazaar to Lukla.6 hours. The final day of the trek; we head back to Lukla leaving the exquisite Sagarmatha National Park and the gateway to the Himalayas. The journey back is a pleasant one filled with oak, pine and juniper trees as the forested trail heads out of the region. The journey back will take us 6 hours through the pleasant and calming trail. Day 14 : Fly back to Kathmandu. We take an early morning flight out of Lukla which again is the home to one of the most thrilling airstrips around. The view from up above before the morning fog rolls in as a mesmerizing sight which spans the entire region. 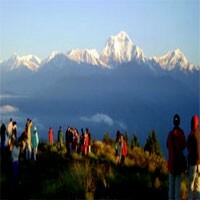 The flight takes about 35-40 minutes and after landing back at Kathmandu you will be transferred directly to the hotel. Overnight stay at a hotel in Kathmandu. Day 15 : Free day and farewell dinner with Frolic Adventure. A free day in Kathmandu is the perfect opportunity to explore the local culture and way of life. Today will be the perfect time to take a step back from all the hectic travel and enjoy yourself at the moment. Also, a great time for souvenir hunting and indulging yourself in the local delicacies of the areas. Back at the hotel, we will have a lovely farewell dinner awaiting you. Overnight stay at a hotel in Kathmandu. Day 16 : Departure to international airport for your final flight. Our representatives will once again drop you back at Tribhuvan International Airport with best wishes for your final flight out of Kathmandu. We hope you had a lovely time trekking with us in the Himalayas.